I love Disney movies. I love video games. What's not to like about this title? I've been scooping out Disney Infinity for a long time now and I still don't know which way to jump. I'm throughly stuck on this magical fence and who knows when I'll pick a side. Maybe the folks of the TAY (greatest reader run blog in the known interwebs) can help me. As I mentioned above, I am a huge fan of Disney movies. While not all franchises are a hit in my book (I'm looking at you Lone Ranger remake) there are still many many titles and characters I adore. What's more my wife (who we'll talk about in a minute) also loves Disney related items. Not only am I an avid video game player, I'm a dedicated video game collector. Infinity is a video game that uses action figures (much like Skylanders) to unlock gameplay. Some think it's shady to lock content on a disc until you purchase a physical object, but hey, it's a genius marketing strategy. Even Nintendo is starting to do it with their Pokemon Rumble franchise. 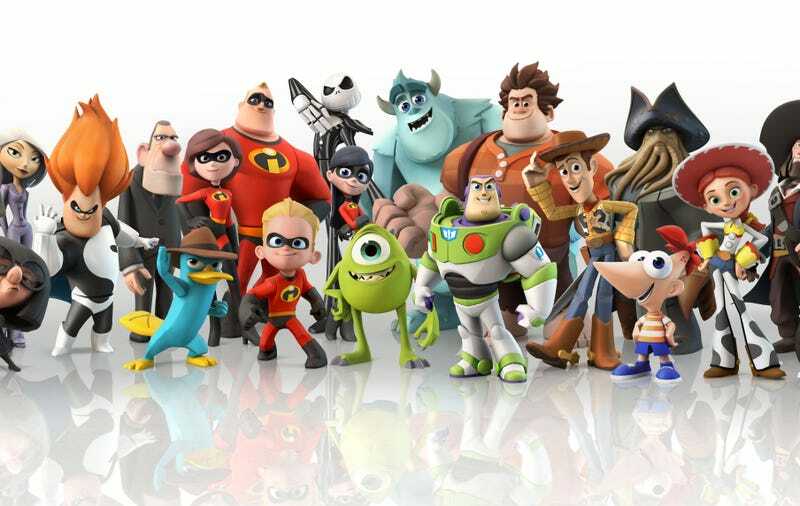 Surely if I start playing Disney Infinity I'll want to collect all the figures and worlds for my own. Look how cute they are! Then there's my wife. A woman who likes to play video games, but gets frustrated easily. Here favorites are the ones where she can help me out or play along side me like Super Mario Galaxy 2 or LittleBig Planet. She also loves life sims like Animal Crossing. She adores the building aspects of it all. So I'm sure she'd be on board to play Disney Infinity and help me design some awesome worlds to romp around in. These all sound likes positives, but all of these good points make the bad point even worse. It's going to be an expensive game! I mean we're talking about a $75 base set, additional packs and individual characters. Yoinks. I could see it really building up and costing me a bundle over time. I love collecting things, I love unlocking thing and I have a steady income, so how could I stop myself! ?